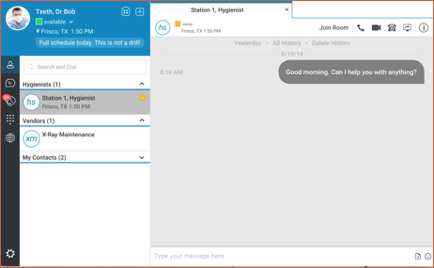 Chat is easy with Voyant Connect. You can start a chat session with anyone in your company. Chats can also be upgraded to calling, video and desktop sharing. To begin a chat with a user, look for the chat icon in many different areas in the client. For example, hover over a contact and the chat icon will show in the lower left. Or click the chat icon on the left to find anyone you’ve recently had a chat with. Double-clicking any contact will have a default action. If you double-click a contact that is in your company, the default is to open a new chat tab. If the user is outside your company, the default action is to call them. When you begin any chat, a new tab will open. Each chat session will open a new tab. You can close any tab at any time. Starting a chat with someone you already have chatted with earlier will restore that chat session. You can also tear off any tab if you want to keep a chat session open in a separate window. Just click the chat tab and drag it away from the client. To send a message, simply type your message in the space at the bottom and press enter to send your message. A list of emoticons is also available on the right side of the message entry box. Chat history can be viewed or deleted using the options at the top of the chat session. The list of available options will change depending on how far back your chat history goes. To add others to a chat session, drag-and-drop another contact from your contact list onto the chat session. You can also add multiple contacts at once by command-clicking or control-clicking each contact in the list to highlight them, then drag-and-drop the group of contacts onto the chat session. While you are chatting, you may find you need to transfer a file to someone. Just click the paper icon in the lower right, then choose a file to send. The file transfer will appear in the chat window and show the transfer progress. The person you are sending the file to will need to accept the file to begin the transfer. Click Cancel Transfer to cancel any file transfer.